The Shield and The Sword – is this houston? 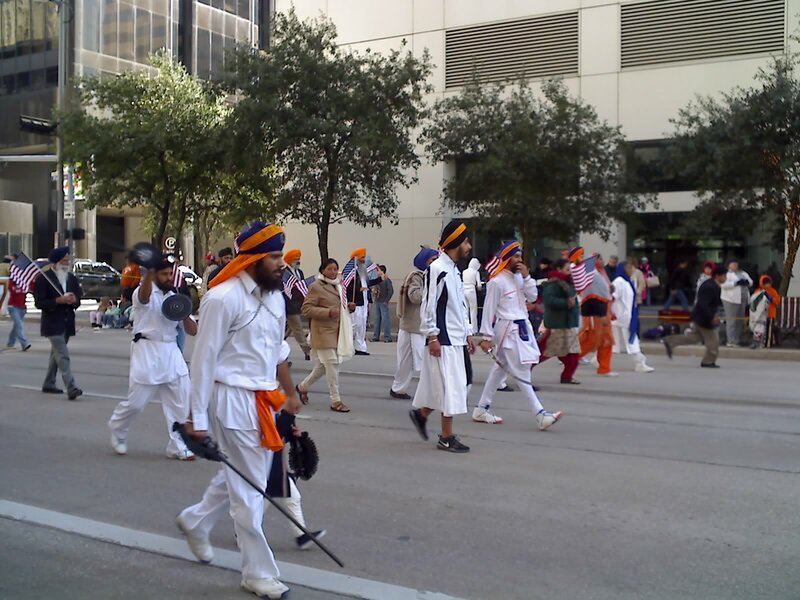 The Sikhism in America group turned up to march in the Downtown Houston Thanksgiving Day parade. I guess they were running on IST (Indian Standard Time) since they were the very last procession marching behind Santa and his sleigh. Representation of other cultures is great in the parade; but couldn’t this community have been more sensible to highlight the lighter side of the Punjabi Sikh community of India (like some Bhangra dancing and the peaceful religious nature of the organization) instead of swinging their swords and waving their shields in the air as they walked down Fannin St. I clicked on your comment and came here I can’t believe there webmaster posted your comment and Link to your site too. As I read and researched they all live and play in Houston. I don’t see much different in cowboys or these people with swords, Maybe you prefer Budweiser wagon, bikers, naughty vets and bikini girls more. Does those represent Houston more. I am an Indian Houstonian living in Europe for last 2 years. I can tell you “No”. Thanksgiving parade there is to show all cultures, colors, fun and hobbies of Houston. You didn’t even read the article (float trailer tire had problem that delayed arrival of our group float thus number in line on parade) and making a joke of whole community as IST. who give you the right criticize. Your suggestion seems good on Bhangra dancing and the peaceful religious nature but looks feels like you are making a joke of a community whose swords saved you ancestors. Thanks for the comment. If the Sikh community wanted to highlight the chivalrous nature of the society, perhaps a better venue would be the Veterans Day parade or during Memorial Day. I am Punjabi by nature. why the hell are u so fed up? The gatka was GREAT! Out of 2175 Martyrs, 1557(75 percent) were Sikhs. Out of 2646 Indians sent to Andaman for life imprisonment, 2147(80 percent) were Sikhs. Out of 127 Indians who were hanged, 92(80 percent) were Sikhs. Out of 20,000 who joined the INA under Bose, 12000(60 percent) were Sikhs.